St Mary's is the parish church of Luddenham. Now redundant, the church is located about two miles north-west of Faversham and about one mile west of Oare. Listed Grade I, with a setting next to Luddenham Court farm and near to the marshes to the south of the Swale, the church has stood for at least 850 years. Constructed mainly in flint and render the church includes re-used Roman tiles in its north-west corner. The west doorway with its zig-zag decoration, dates from c.1150 and the long chancel from the 1200s, whilst the curious little south-west tower was rebuilt in red brick in 1807. the church was restored in 1881-4 and the porch added in 1889. The pair of hands on a 13th century coffin lid inside may well be holding a heart. The last recorded service here took place in 1971. 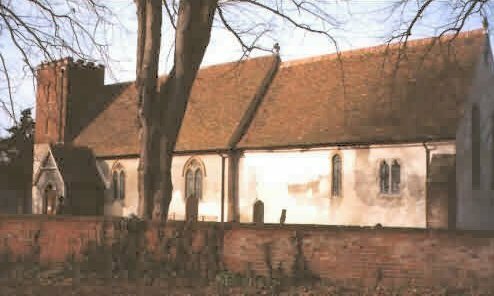 The church was declared redundant in May 1972 and was vested in the Churches Conservation Trust in March 2002.